Primavera Hostel i Barcelona, Spania: Bestill nå! 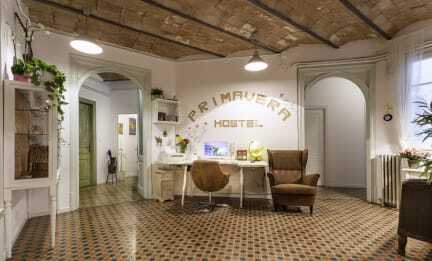 Primavera hostel is located in a building of the Barcelona of the early twentieth century, which has been renovated and transformed into a dynamic, bright and warm space preserving the touch of traditional architecture and decoration but with designs that transport it to modernity. Primavera hostel is designed for a kind of traveller who is looking for comfort, good service but without having a high budget. We offer spacious private rooms and bedrooms very well distributed. We are committed to making your stay comfortable and safe. We have wireless Internet service, lockers, a wide kitchen and living room where you can also share with people from around the world! We are located in the heart of Barcelona, just meters from the famous Gaudi Church: The Holy Family and a few minutes from down town. From our property you can go to all the attractions of the city quickly and safely due to we are only a few steps from metro stations and bus stops.